Louisa Anne Beresford (née Stuart), Marchioness of Waterford (1818-1891), Unknown Boy (3 February 1888), watercolour and pencil, 8.7 x 15 cm, National Portrait Gallery (Given by Anne Horatia (née Richmond), Lady Piper, 1994), London. Courtesy of and © National Portrait Gallery, London. My interest in the paintings of Louisa Anne Beresford (née Stuart), Marchioness of Waterford (1818-1891) arose as the result of today being the bicentenary of her birth, on 14 April 1818, and the repeated statement that she was a Pre-Raphaelite. What I have found is fascinating, and her paintings worth looking at, but quite different. Beresford was born in Paris into British nobility, the daughter of a Baronet whose family home was a castle overlooking the English Channel, who happened to be the British Ambassador in Paris at the time. In 1842, she married the Marquess of Waterford, so acquiring her title. She was apparently taught drawing by John Ruskin, although as he was a year younger than her, I suspect that was not until her adult life. She was also allegedly taught to paint by Dante Gabriel Rossetti, although as he was ten years younger than her, I suspect that did not start until after 1850. But she was different. One of the family estates included the small village of Ford, close to the eastern end of the Scottish border in Northumberland. When Beresford’s husband died in a riding accident in 1859, she determined that she would improve the welfare of her tenants, so rebuilt their houses and the village church, and had a new school constructed for them in 1860. She painted extensive murals for the school, now known as Lady Waterford Hall, although sadly I have been unable to locate good images of them. These were painted on large sheets of paper, which were then mounted on canvas and affixed to the walls, and were not completed until 1882. From 1880, she was also occupied in work to prevent the family castle in Dorset from collapsing as a result of coastal erosion. As a friend of Rossetti and Ruskin, Beresford was a member of the Pre-Raphaelite inner circle. It is thought that she modelled for John Everett Millais, although I don’t know of any identifications of her in his paintings. Apart from her wall paintings, very little of her work is now accessible. The only works that I have been able to trace in public collections are one book of watercolour sketches spanning the years 1887-88, which is in the National Portrait Gallery, and a couple of larger watercolours in the Tate. 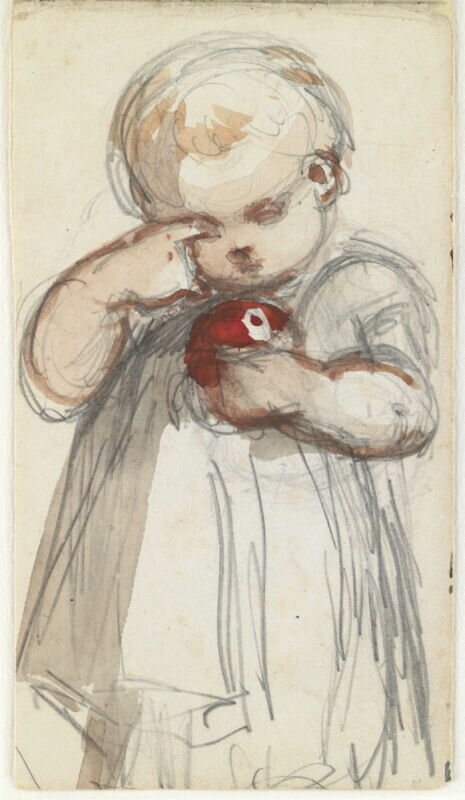 Louisa Anne Beresford (née Stuart), Marchioness of Waterford (1818-1891), Unknown Child (19 June 1887), watercolour and pencil, 8.7 x 15 cm, National Portrait Gallery (Given by Anne Horatia (née Richmond), Lady Piper, 1994), London. Courtesy of and © National Portrait Gallery, London. 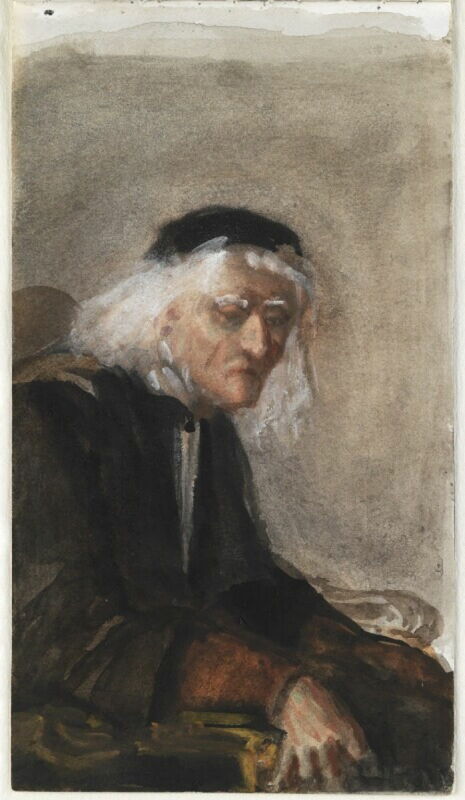 The book in the National Portrait Gallery contains a series of pencil and watercolour sketches made by Beresford over a period of about a year, from the middle of 1887. Most, like this sketch of an Unknown Child from 19 June 1887, are brisk and painterly, and have no further identification. 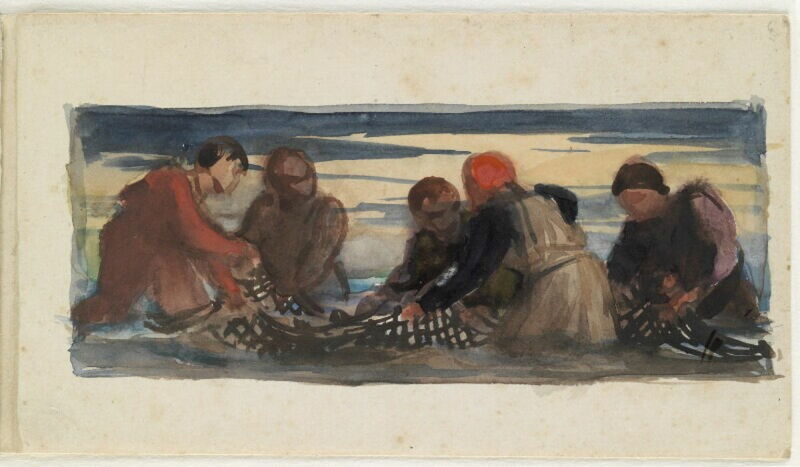 Louisa Anne Beresford (née Stuart), Marchioness of Waterford (1818-1891), Group of Five Men Working with a Net (1887), watercolour, 8.7 x 15 cm, National Portrait Gallery (Given by Anne Horatia (née Richmond), Lady Piper, 1994), London. Courtesy of and © National Portrait Gallery, London. Several show scenes such as a Group of Five Men Working with a Net (1887) which were painted on the coast, most probably near the artist’s family home in Dorset. Her estate in Northumberland was well inland. 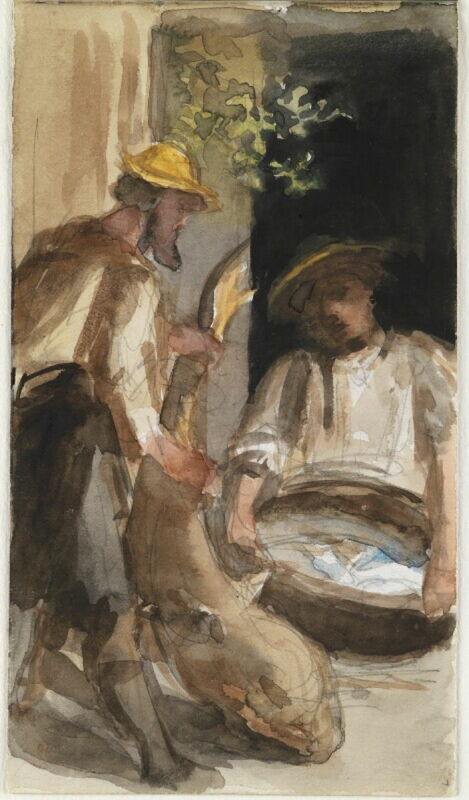 Louisa Anne Beresford (née Stuart), Marchioness of Waterford (1818-1891), Two Unknown Men, Possibly Fishermen (26 July 1887), watercolour and pencil, 8.7 x 15 cm, National Portrait Gallery (Given by Anne Horatia (née Richmond), Lady Piper, 1994), London. Courtesy of and © National Portrait Gallery, London. Two Unknown Men, Possibly Fishermen, from 26 July 1887, shows a fish of impressive size. Louisa Anne Beresford (née Stuart), Marchioness of Waterford (1818-1891), Marianne Margaret Egerton (née Compton), Viscountess Alford (‘Lady Marian Alford’) (30 August 1887), watercolour and pencil, 8.7 x 15 cm, National Portrait Gallery (Given by Anne Horatia (née Richmond), Lady Piper, 1994), London. Courtesy of and © National Portrait Gallery, London. Beresford’s portrait of Marianne Margaret Egerton (née Compton), Viscountess Alford (‘Lady Marian Alford’) (30 August 1887) shows this elderly amateur artist, patron of the arts, and a particular champion of needlework, both as a fine art and for the employment of women. Although Alford was only a year older than Beresford, she died the following year. 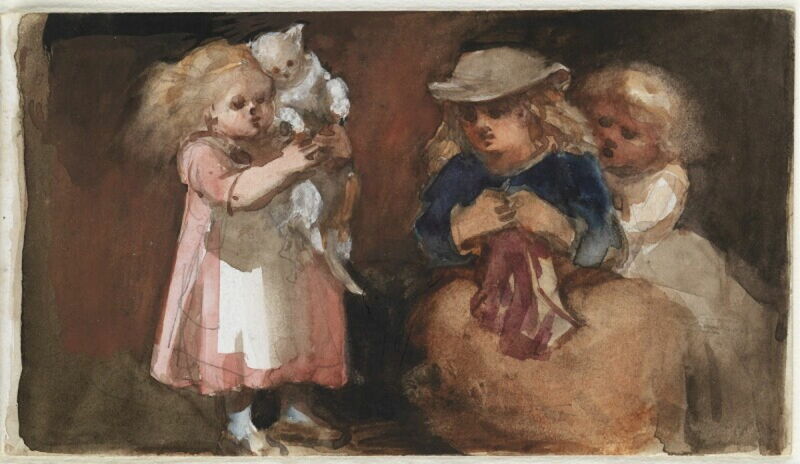 Louisa Anne Beresford (née Stuart), Marchioness of Waterford (1818-1891), Three Unknown Children and a Cat (25 October 1887), watercolour and pencil, 8.7 x 15 cm, National Portrait Gallery (Given by Anne Horatia (née Richmond), Lady Piper, 1994), London. Courtesy of and © National Portrait Gallery, London. Beresford’s small paintings of children, as in Three Unknown Children and a Cat, painted on 25 October 1887, are particularly good. 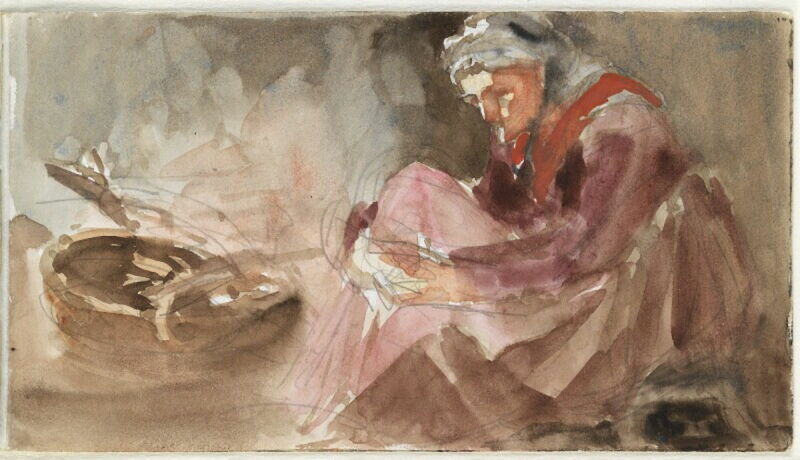 Louisa Anne Beresford (née Stuart), Marchioness of Waterford (1818-1891), Old Navvy (26 October 1887), watercolour and pencil, 8.7 x 15 cm, National Portrait Gallery (Given by Anne Horatia (née Richmond), Lady Piper, 1994), London. Courtesy of and © National Portrait Gallery, London. Her portrait of an Old Navvy (26 October 1887) demonstrates her use of Chinese White rather than reserved space. 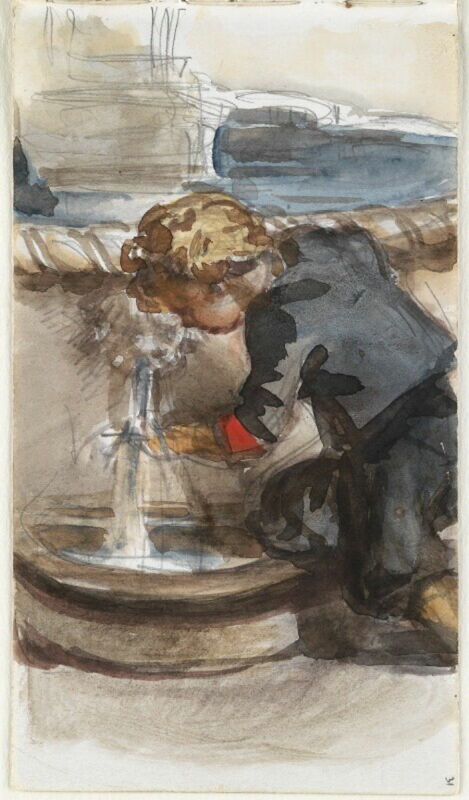 This painting of an Unknown Boy drinking at a fountain on 3 February 1888 is one of the finest in the book. 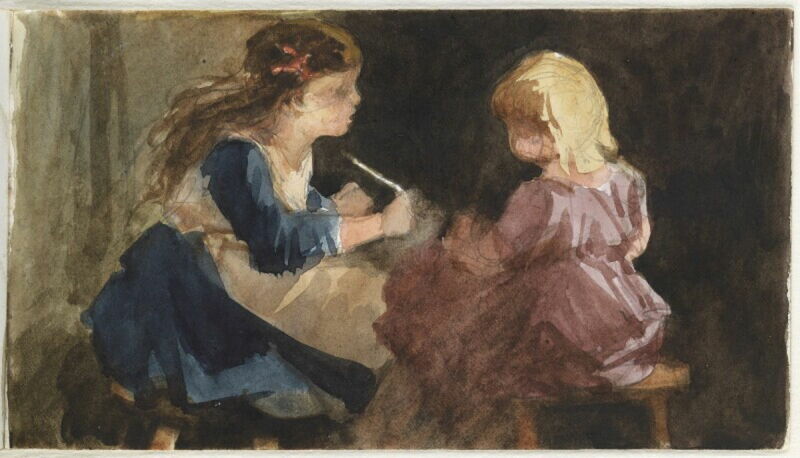 Louisa Anne Beresford (née Stuart), Marchioness of Waterford (1818-1891), Two Unknown Girls (17 April 1888), watercolour and pencil, 8.7 x 15 cm, National Portrait Gallery (Given by Anne Horatia (née Richmond), Lady Piper, 1994), London. Courtesy of and © National Portrait Gallery, London. These Two Unknown Girls were painted on 17 April 1888. Louisa Anne Beresford (née Stuart), Marchioness of Waterford (1818-1891), Two Children Picking Flowers (date not known), watercolour, dimensions not known, Private collection. Image by Rodolph, via Wikimedia Commons. 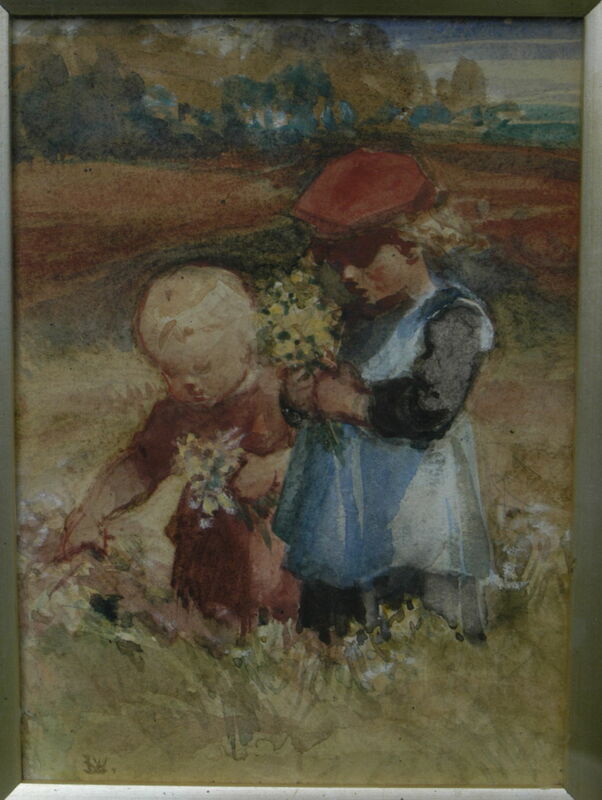 Her more substantial paintings include this undated scene of Two Children Picking Flowers, which remains in a private collection. Her two undated paintings in the Tate’s collection are both of religious motifs, which may have coincided with her work on related themes for the murals in the village school in Northumberland. 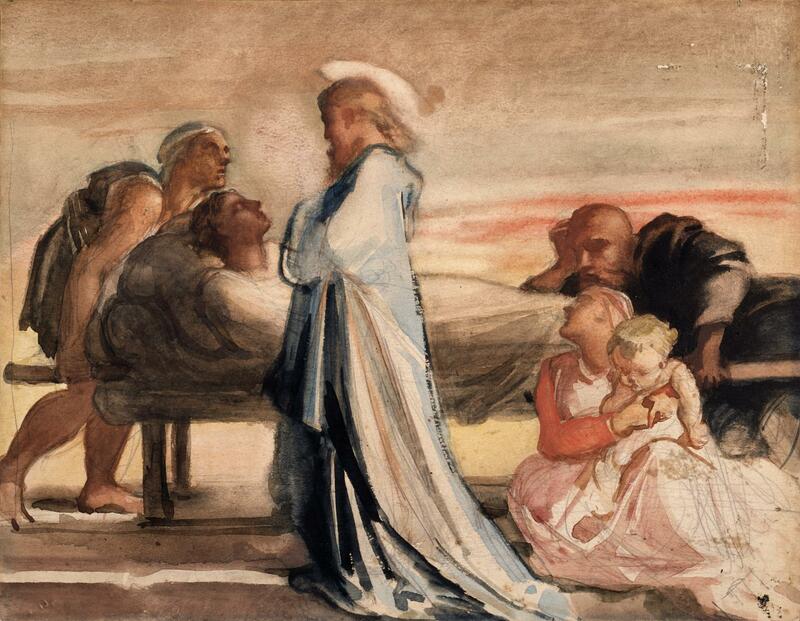 That above shows Christ Raising the Dead and does have a distinct Pre-Raphaelite feel to it. Sleeping Disciples below features a timeless composition and skilful use of colour. Beresford died in 1891, and is buried in Ford churchyard; her gravestone was designed by George Frederic Watts, and its slab by his wife. It is tragic that so few of her paintings are now accessible. As she had little incentive to sell her work, and doesn’t appear to have exhibited much until the 1870s, most must have gone into private collections. What remains suggests that there may be hidden treasures; for someone with the time and energy to track her paintings down, the reward could be well worth their effort. They might then discover whether she really was a Pre-Raphaelite artist. Posted in General, Life, Painting and tagged Beresford, Millais, painting, Pre-Raphaelite, Rossetti, Ruskin, watercolour, Watts. Bookmark the permalink. There is a whole room of Lady Waterford’s paintings on display at Kiplin Hall, a Jacobean house located between Richmond and Northallerton in North Yorkshire. The house is open to the public from April to October, Saturday to Wednesday, 11am-5pm. There are also many of her watercolours on display in the Lady Waterford Hall, Ford, along with the wall paintings. Wonderful – thank you letting us know. Are there any images of those paintings available online yet?